Jim Bob and Michelle Duggar, whose family is chronicled on the hit TLC show 19 Kids and Counting, recently lost the baby that Michelle was carrying. Jubilee Shalom Duggar was stillborn on December 11th when she was 19 weeks along; she weighed just 4 ounces. This family is obviously mourning the loss of their daughter, and they should be given time to grieve. I have debated blogging on this issue because I believe in privacy, but yet it is the need for privacy that has compelled me to write this. I have been disgusted by the criticism this family has received. This family has many critics for the same reason Tim Tebow does: they are successful Christians, and non-believers can’t stand that. They passionately love Jesus, live holy lives, and enjoy life. They are proof that Christians don’t need filthy TV, sexual music, or alcohol to have a good time, and for that, liberal Christians have become their critics as well. The 19th Duggar baby, Josie, was born early and spent a few months in the NICU. There were harsh comments made then about how careless it was for them to continue to have children. So last month when the Duggars announced that Michelle, now 45 years old, was pregnant again, the blogosphere erupted with more of the same. I’m having trouble reconciling these comments of concern for the loss of a baby with the political agenda that says Michelle could have aborted this baby if she wanted to. These people are saying that the Duggar family’s selfish desire for another child has caused this tragedy, but since the majority of their critics are liberals, these comments are being made from people who would be just fine (some even delighted) with her choosing to abort. What I find distasteful is a woman who hasn’t lost a child trying to weigh in on how the parents are supposed to grieve. The woman who said that, a psychologist named Susan Newman, should know that there is not a textbook way to deal with a loss. A frequent critic of the Duggars, she is putting her professional skills aside to take a stab at this family. She assumes that parents will not want pictures of their lost children, so I wonder how she explains organizations like Now I Lay Me Down To Sleep, which take pictures especially for families that have lost a child. When my aunt and uncle had a stillborn daughter they took many pictures, some of which are still displayed in their house along with their other children’s photos. They also had a memorial service. For this psychologist to claim that the Duggars are only doing those things to exploit their children is absurd. 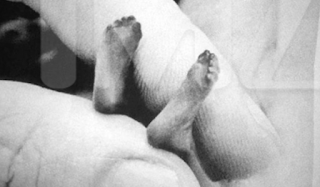 The real reason why this is disturbing people is that these beautiful pictures of tiny hands and feet hurt the abortion issue. An overwhelming percentage of women (every survey puts the number in the 90%’s) who have aborted said they were given very little information about how abortion works and about the life that was developing inside of them. 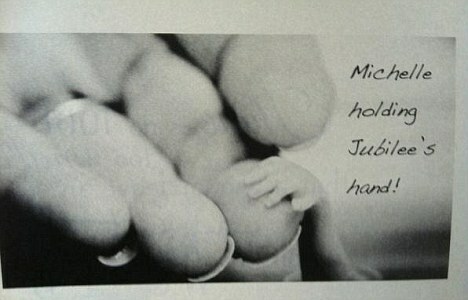 Pictures like these might help young ladies realize that it is not a “glob of tissue,” but a tiny human. This scares liberals. As I explain in my book Asleep in Heaven’s Nursery, life begins at conception, and these babies that were lost too soon are immediately ushered into heaven. The Duggars’ strong faith in the Lord assures them of this, and they know that they will see Jubilee in heaven. I hope that no professing Christian is criticizing this family during this time of tragedy. As Christians, let’s take this opportunity to pray for them. Pray that God’s Holy Spirit will provide the Comfort that He promises, and pray that this family will continue to be a light for Jesus Christ to millions of people every day. Several times over the last few weeks I have had the opportunity to sit down with people and hand them a free copy of Asleep in Heaven’s Nursery. These people were parents who had recently lost children to infant mortality, and I was directed to them by mutual friends. While there are no easy words to say in these situations, it is an honor to be able to provide a free book that will hopefully answer some questions they are facing, and that will definitely present the gospel. Even though I am the one sitting on their couch and giving them a free book, I am not the only one who plays a part. These books that I have donated have been paid for through the Rachel Dowd Book Sponsorship Program. Rachel Dowd was stillborn on May 31st, 1995, to Chuck and Carol Dowd in Alabama, and their story can be read in the Testimonies section of Asleep in Heaven’s Nursery. The Rachel Dowd Book Sponsorship Program was created to provide free books as a ministry to those who have lost a child. A gift of just $10 will put a book into the hands of one of these grieving parents. Your donation is tax deductible, and it can be made in honor of or in memory of someone. 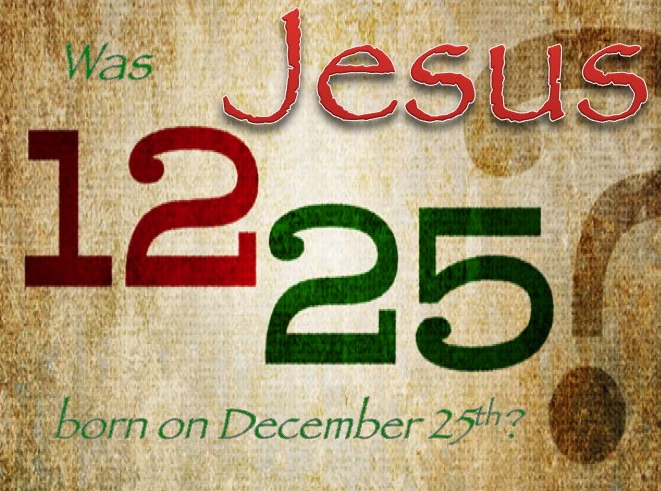 Gifts made in someone’s memory or honor will be listed on the Tommy Mann Ministries Facebook Fan Page.